Ok… here is the deal. Many were asking about my model ‘goose’ – so I went back to visit the refuge yesterday and decided to do some more investigating. I wanted to make sure it was a wild ‘snow goose’ which I ‘d believed it was based on research. 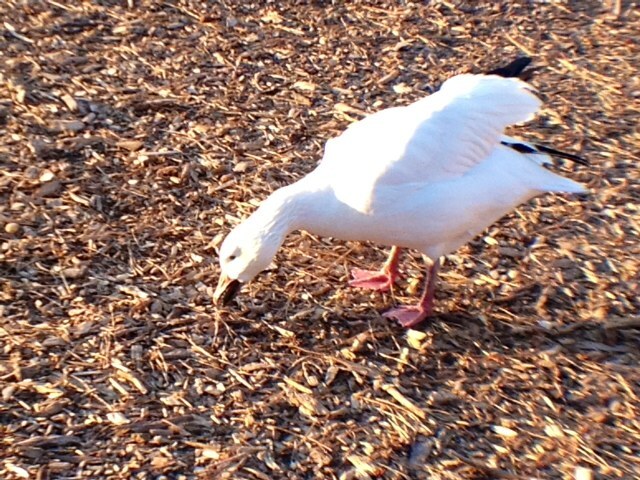 I concluded it must be, since it was white and in the wild…and looked like the snow geese I’d seen on google images. I even consulted my Uncle Alan who is a bird watcher/expert. He asked if there were any dark feathers on the goose’s wing, as snow geese typically had this. I did not recall dark feathers – but thought maybe they were underneath and not visible. Well, it turns out there was much more to the story! When I arrived yesterday, Mr. goose warmly greeted me at the entrance. I immediately found a lovely young woman who worked for the refuge, and told her I wanted to learn more about this creature! It was explained to me that an unknown party dropped this goose off at the refuge just last week. It was a total surprise and he (though they can’t be sure on the gender?) is a domestic variation called an Embeden goose (origin- Holland or Germany). It seemed evident that someone could no longer care for this beautiful bird, so left it at the nature preserve hoping it would be protected there. And so, it will be. This sweet goose will be cared for at the wildlife refuge forever more, enjoying a nice life with its wild cousins and other feathered friends. He is unusually friendly, likes to be pet…and will even sit on your lap! Is it any wonder it knows how to model too? Here are photos I shot yesterday of one of the Quogue Wildlife Refuge employees showing some love to Mr. Goose! 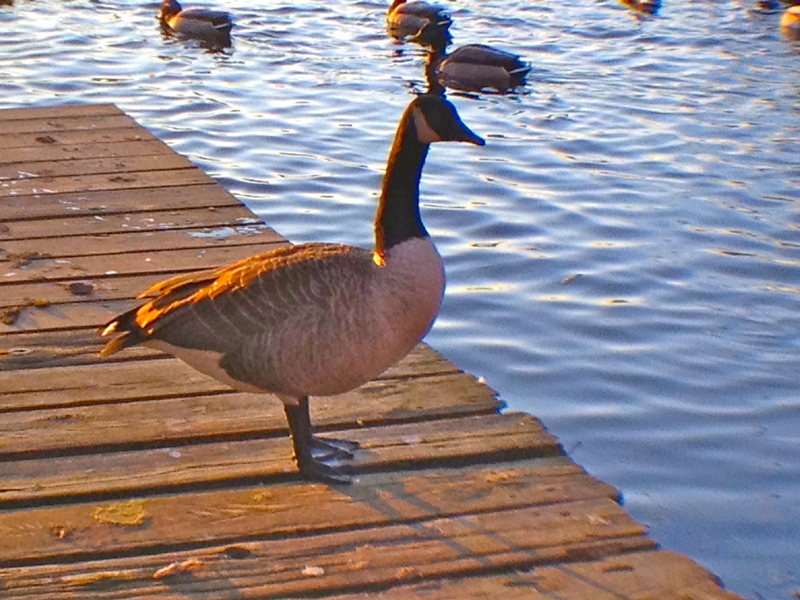 Dear Robyn: Great pictures of beautiful creatures, your idyllic geese. Thank goodness their goose does not get cooked. Unfortunately this is not always the case. The existential reality is (I feel like I’m telling someone there is no Santa Claus) that in France and many parts of Europe, the geese are raised and prized for their liver. Therein lies the rub. They continually and brutally have food stuffed by hand all the way down their throats until the liver, in a relatively short period of time, grows to five times its normal size. Remember the world axiom of time is money! The goose liver is served as a delicacy in the form of a pate, called, pate de foi grass. (goose liver) and is eaten in all French restaurants, cafes and homes, etc. 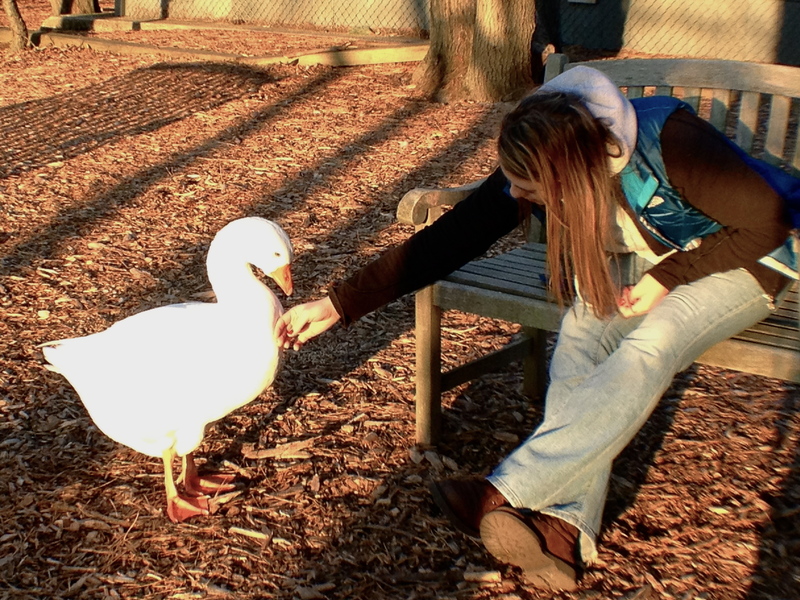 So your beautiful goose is lucky and thank goodness he lives in the good ol’ USA. Too much information? Sorry Robyn. (idyllic point and surrealist counterpoint). Forgive me for appearing pedantic in making a short note into a treatise on goose liver. XOXOX Angelo. Oh…there is no end to this education I am receiving on this species! I much prefer the more spiritual facts I gathered on the wild geese (see: Paradoxical « THROUGH THE HEALING LENS). 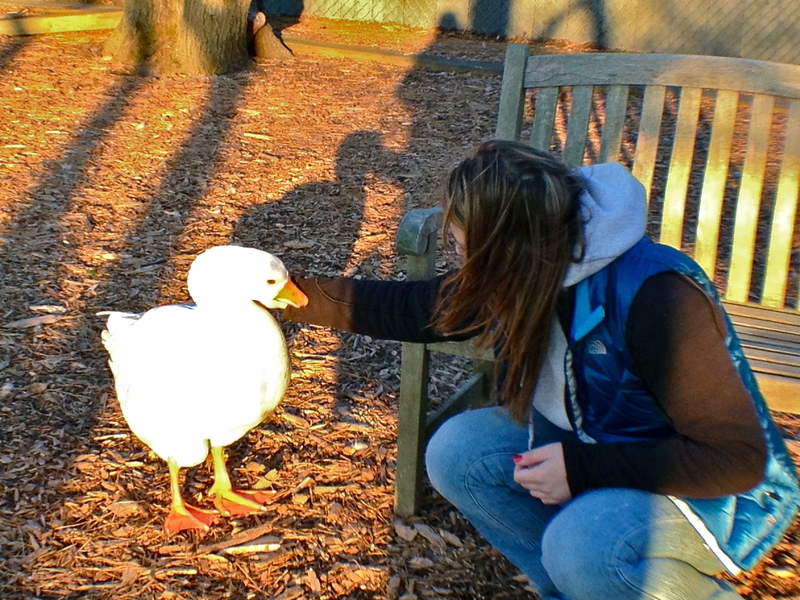 I saw my domestic goose friend again today. I think he thinks he is a dog. Greets you at the gate and makes all kinds of noise (saying hello) and literally wags his tail (I mean wings). The staff their said that he was obviously someone’s pet. Since he is quite large, some of the visitors are a bit afraid of him. Do hope he gets to stay and live out his existence there, and never gets eaten!! I have had pate of goose liver actually – and liked it at the time, but now having a new-found appreciation for these creatures, I’ll pass next time it’s offered! Thanks for all the great info!